Soft Cover, 256 pages, 6.25 x 9.25. Brewing Up a Business is an entertaining, enlightening first-person account of author Sam Calagione's nontraditional success as an entrepreneur. Starting out with a home brewing kit cobbled together from used kegs, Calagione turned his entrepreneurial dream into a reality. Relying on unique brews, lots of loving technique, and hard work, Calagione built Dogfish Head Craft Beer into America's fastest growing brewery. Without the benefit of an advertising budget, Dogfish went from a tiny operation in Delaware to one of the country's most popular craft breweries, distributed in 29 states and four countries. As revenues grow at lightning speed-an increase of 105 percent in 2003-Dogfish's success is the result of dreaming big, working hard, and thinking unconventionally. With real lessons on entrepreneurship and success from a real entrepreneur, as well as practical ideas on nontraditional marketing, this is a business story that will open readers' eyes to the unquantifiable benefits of thinking differently. This is the exhilarating success story of a man who really likes beerso much so that he decided to make a business of it. Starting with nothing but a home brewing kit, Sam Calagione turned his entrepreneurial dream into a foamy reality and built the country's fastest growing breweryDogfish Head Craft Brewery. 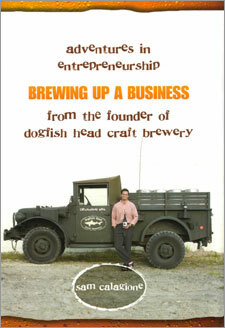 Brewing Up a Business is the enlightening and entertaining story of Dogfish and Calagione, of the power of unconventional thinking, and of the hard lessons every entrepreneur learns along the way. In just a few years, Calagione grew Dogfish from a tiny Delaware-based operation into one of the country's most popular independent brews, distributed in twenty-nine states. Along with creating the fastest growing independent brewery, he has established a successful restaurant featuring wood-grilled food, and expanded his brand to include a line of spirits made at his distillery. Even without the benefit of an advertising and marketing budget, Dogfish's revenues have soaredincreasing by more than 100% in 2003 alone. That kind of success might not be normal for most small businesses, but then again, there's nothing normal about Calagione and Dogfish. From his attention-grabbing publicity stunts, as when he crossed the Delaware River in a homemade boat to introduce his beer to New Jersey, to the creation of such questionable concoctions as peppercorn and lavender flavored beer, doing things differently has been the key to Calagione's success. It hasn't always workedfew people really wanted peppercorn and lavender flavored beer after allbut this fearless entrepreneur learned quickly that you can't reap big rewards without taking big risks. Straight from Calagione's mouth, Brewing Up a Business offers a real-world look at what entrepreneurship is really like. It's hard work and frustrating to be surefrom exploding fermentation tanks to selling t-shirts at truck stops for gas money, Calagione encountered all the trials and tribulations of starting and running a businessbut it's been worth it. With business booming, Calagione could probably stay the course, play it safe, and focus on doing what he's doing. But why would he? As you'll learn in Brewing Up a Business, being an entrepreneur is much more than just a lot of hard workit's a lot of fun too. There are new beers to brew, restaurants to open, and beer movies to make. Dogfish is proof that entrepreneurial dreams do come true. And Calagione is proof that you don't need a million dollars in seed money or a Harvard MBA to make your business a reality. For anyone who has a dream, this is all the inspiration and motivation you need to get started brewing up your own business. SAM CALAGIONE is the founder and owner of Dogfish Head Craft Brewery in Milton, Delaware, the nation's fastest growing independent brewery, and Dogfish Head Brewings & Eats in Rehoboth Beach, Delaware. His innovative style has earned him a reputation as one of America's most adventurous entrepreneurs and brewers. The Small Business Association has named him Businessman of the Year. He lives in Lewes, Delaware.